... yet on the other side of things, nothing makes me feel better in the morning than indulging in an overflow of carbs and syrup. It's a vicious cycle. I have to find some sort of compromise. I am not going to top my pancakes with any type of fruit (something I consider to be pure blasphemy), so that only leaves me one option: to revise the actual pancake recipe. Since my husband won't eat anything white, I decided to take a shot and make some whole wheat pancakes. I've played with a few different variations, but this is it. 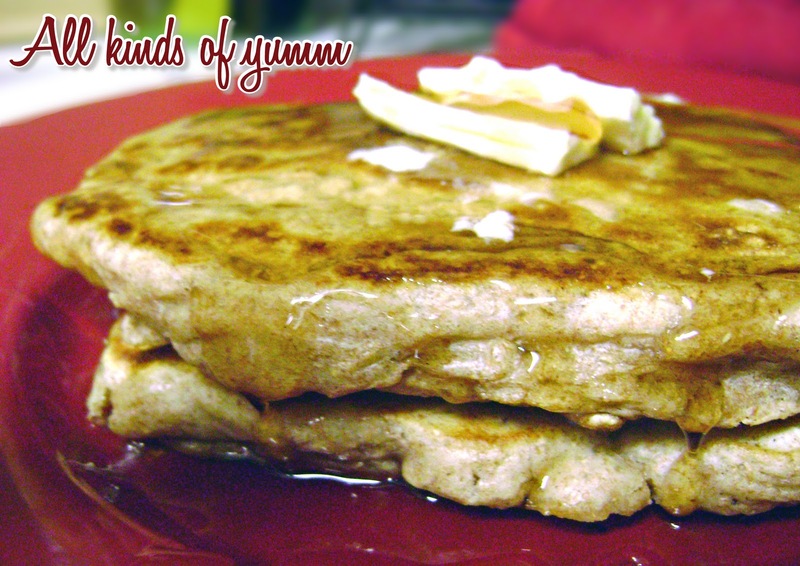 It's as simple as any other pancake recipe, just with one or two simple substitutions. So for heaven's sake, stop feeling guilty and eat the pancakes. Rach, all the food from this site is making me want mac and cheese, the chewy kind. Do one on that and you're golden. 5000000+ Readers, guaranteed.